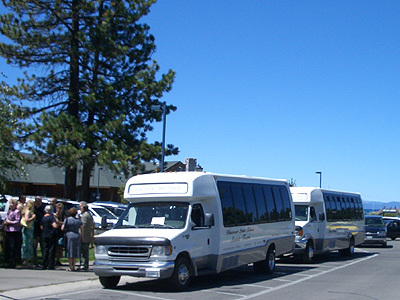 Discover Lake Tahoe’s sightseeing tours and bus charters include local, regional and state wide destinations and is the only tour company ever to offer tour to Yosemite National Park from Lake Tahoe. We also offer bus charters / rentals for all occasions such as weddings, corporate events, airport transfers and private tours. Scenic bus tours are now only offered from mid April – November. In the winter, we are the ski shuttle provider to Northstar and Kirkwood ski resorts. Our fleet consists of modern shuttle buses equipped with flat screen TV, DVD player , AC, air ride suspension, reclining seats and more. Two of our 28 paasenger shuttles picking up at Ski Run Marina. 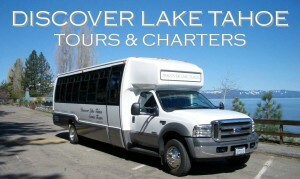 Serving lodging properties in South Shore and beyond, all tours originate in South Lake Tahoe / Stateline area. Formerly known as Demo Tours, Discover Lake Tahoe is South Lake Tahoe’s premier tour and shuttle bus charter company run by long time Tahoe resident, Janez Demsar. Janez is more than just an avid skier. A former member of the Yugoslavian National Team, he has enjoyed similar success here in the states with a first place finish at the North American Freeride Championships as well as participating in X-games (skierX) with some of the world’s greatest. Closer to home Janez has set bar high by winning Heavenly’s Gunbarrel 25 an unbelievable eight times.